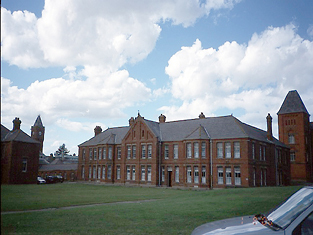 The whole of the peninsula of Portrane has, in recent years, been altered by the erection of the great lunatic asylum in the grounds of Portrane House, a spacious mansion, now utilised in connection with this institution, and situated nearly in the centre of what was formerly an extensive deer park. The railway runs almost centrally across the peninsula, having a station at Donabate, and crosses by two causeways and bridges, the Rogerstown and Malahide creeks to the north and south of Portrane respectively. Those desirous of exploring this rather isolated portion of the county on foot should take return tickets to Donabate, while those proceeding thither on bicycles should go by the main road through Swords, turning to the right about two miles north of the latter town. Donabate is a small scattered village, containing a handsome red brick Catholic Church, as well as the ancient church which originated the name, Domnach-bate (i.e., the Church of the Ferry), and which still remains in excellent preservation enclosed within its graveyard. Adjoining and almost forming portion of Donabate is the primitive-looking village of Ballisk, consisting mostly of thatched cabins of a very poor description. A mile and a half from the railway, on the road to the Coastguard Station is the ivied ruin of Portrane Castle, a square tower standing in a field, without any trace of either bawn or outworks. At the Suppression of the Monasteries this edifice formed portion of the possessions of the wealthy religious community of Grace Dieu, all the property of which thereafter passed into the hands of Sir Patrick Barnewall, of Turvey, subsequently coming into possession of the Cusacks of Rathaldron. Within sight of the castle, and situated almost on the Sea shore, are the ruins of Portrane Church, surrounded by an embattled wall and sheltered by trees; it was evidently at one time an extensive building, and its square ivied tower is still a conspicuous object in the neighbourhood. Adjoining the Asylum is a modern round tower, erected o~ the summit of a rising ground by a former proprietor, Mrs. Evans, as a memorial to her husband, whose bust is placed in the interior of the structure. This tower was formerly a very remarkable feature on the peninsula, being about 100 feet high, but is now much dwarfed by the proximity of the extensive buildings of the Asylum. The entrance door is situated, as in the ancient round towers, at such a height from the ground that it can be reached only by a ladder, and is surmounted by the armorial bearings of the Evans family. The view from the high ground adjoining, comprises Lambay Island - only three miles away - the extended distant panorama of the mountains, and to the north a fertile undulating tract, bounded by the low range of hills near the northern boundary of the county, on one of which stand the massive ruins of Baldongan castle. Northwards, on the opposite side of Rogerstown Creek will be seen the white cottages of the town of Rush, extending along the shore. In ancient times Lambay, when it possessed an ecclesiastical establishment, was a place of some note, and its port of embarkation, Portrane, came to acquire a sort of borrowed importance. Rechra or Rechrain was the ancient name of Lambay, and its port consequently was Port-rechrain, afterwards smoothed down into Port-rahen and Portrane. the southern side of the peninsula and facing Malahide, is Corballis, which in the 14th century was in possession of the Barnewalls, and in the 17th century was the residence of Luke Netterville, who in 1641 assembled a force of 1,200 men at Swords as a protest against the lawless conduct of some soldiery from Dublin. On the death of Netterville in 1648, the estate was granted by Parliament to Lady Harcourt, widow of Sir Simon Harcourt, who was killed at the siege of Carrickinines Castle in 1641. An appalling shipping disaster, probably remembered by some of the older residents of Dublin, occurred off this coast in 1854. On Thursday, the 19th January in that year, the emigrant ship, John Tayleur, a clipper-built sailing vessel of 1,970 tons, left Liverpool for Melbourne. The entire number on board was 579, of whom 460 were passengers, principally emigrants, and the vessel besides carried valuable general cargo. The accommodation and appointments were of the best description, but she was insufficiently manned, having only tenpProper seamen among the crew, the rest being unskilled Lascars and Chinese, most of whom could not understand the captain's orders, and who, even if they did, were totally incapable of carrying them out. Soon after the pilot left, a squall coming on, orders were given to shorten sail, and it became evident that the crew were entirely incompetent to manage the vessel The mate could not get anyone to shorten sail, and for a long time the ship was at the mercy of the wind and waves. After prolonged efforts, some of the sails were taken in, but others had to be left as they were, and these continued throughout the night flapping and beating in a most alarming manner. Terribly rough weather was presently encountered, followed by a fog, which resulted in the vessel departing so much from her course that by the time she had been two days out of the Mersey, instead of being in mid-channel, she was quite close to the Irish coast. On Saturday about noon it was rumoured in the cabin that land had been seen and that the officers were afraid that the vessel would go ashore. The terror-stricken passengers crowded on deck and then saw before them the bleak and rocky coast of Lambay, against which the waves were beating furiously, while the vessel, now quite out of control, was rapidly drifting towards it. Frantic, but ineffectual efforts were made to alter her course, and as a last resource two anchors were dropped, but the cables snapped as if they had only been twine. A terrible scene of confusion now ensued, some going down to the cabin to seize their effects, some praying, and others taking leave of their friends. The ill-fated ship soon afterwards struck with fearful force on a reef of rocks on the east coast of Lambay, between the Seal Hole and the extreme easterly point, called the Nose. Rising on the next wave, she struck heavily a second time, the sea making a clean sweep over her amidships, and carrying away nearly everything on deck. It was soon evident that the great ship was slowly sinking by the stem, and the passengers rushed up the hatchways, men carrying their children, and women with their infants in arms, screaming and imploring help. Lascars, who scampered away with all haste up the rocks, without waiting to give any assistance to those on board. Another of the passengers then swung himself ashore by a rope, and retaining hold of it, managed to land safely a great many more. A number of young Irishwomen who endeavoured to get ashore in this manner lost hold of the rope and fell into the sea. The ship's doctor, Dr. Cunningham, made a desperate attempt to save his wife and child, but failing, perished with them. The rigging was crowded with hundreds, who, in their terror and confusion, frustrated each other's efforts to get ashore. At length the whole ship, with a lurch, sank below water, and in a few moments~ the remainder of the passengers, with the exception of two in the rigging, perished. The coastguards arrived upon the scene soon afterwards, and at once proceeded to rescue the two survivors, but succeeded with only one, the other, who was near the top, having to be left in his terrible position, notwithstanding his piteous cries to be taken off. About two o'clock next morning, however, the storm having abated, they managed to rescue him after he had been in the rigging for fourteen hours. Of the total number on board, only 282 were saved, and of these, many were severely maimed and injured. Owing to the density of the fog and the remoteness of the locality, no help was forthcoming from the mainland, and the terrible news did not become known in Dublin until the following afternoon, when the City of Dublin Steam Packet Company's boat Prince was despatched with all haste to the scene of the disaster. The Prince anchored about half a mile off the island, and the captain despatched three boats ashore to take off the survivors, who were discovered encamped in the neighbourhood of the Coast Guard Station, in a grassy hollow, sheltered by the hill. A few had gone in the early morning by fishing boats to Malahide, whence they travelled to Dublin by train. The losses were most numerous among the women and children, of whom, 250 in number, only three were saved. The majority of the passengers were Irish emigrants who but a short time previously had set forth on their voyage full of anticipations of a prosperous future. The inquest on the victims, which was opened a few days afterwards at Malahide, lasted three days, two of the bodies having been carried across from the island for the purpose. About 100 of the bodies were buried in the little churchyard on the island, near the harbour, and for a considerable time afterwards, divers were employed in searching for treasure sunk wit the wreck. The bay where the vessel struck has since been known as Tayleur Bay. Situated on the straight road between the village of Donabate and the main road to Drogheda, is Turvey, the ancestral estate of the Barnewalls, Lords Trimblestown, and Barons of Turvey. The original mansion was built by Sir Christopher Barnewall in 1565, according to a tablet which formerly stood over the west gate, but which has since been placed at the back entrance to the residence. It bears the inscription - "The arms of Sir Christopher Barnewall and Dame Marion Sharle, alias Churley, who made this house in Anno 1565." According to common tradition, the mansion was erected out of the materials of the famous Convent of Grace Dieu (see Index), which had been granted to Sir Patrick Barnewall at the Suppression of the Monasteries, and some colour is lent to this story by the complete disappearance of all vestiges of that extensive establishment which can hardly be due to the mere efflux or time. Sir Patrick Barnewall seems to have resided at Grace Dieu for some years, as appears by a letter of his dated therefrom in 1540. The original residence was taken down in the 18th century, and the present edifice, a plain building with a terrace in front, erected on its site. It probably is incorporated with some portions of the former structure, as it contains secret hiding places, passages and staircases, which would be unlikely to enter into the design of a building of such recent date as the 18th century. In the garden at the back of the house is a tablet with an inscription, dated 1570, in memory of Lady Barnewall, alias Sharle, which formerly stood on old Turvey Bridge erected by her. This manor belonged in the 15th century to the Ormonde family, by whom it was ceded in 1556 to Sir Christopher Barnewall, above mentioned, a lawyer of eminence, and High Sheriff of the County, who died here in 1575. The Barnewalls are an ancient Breton family that came over to England with William the Conqueror, "le Sieur de Barneville," having been one of the knights in the service of that monarch at the Battle of Hastings. About the beginning of the 13th century, according to Stanihurst, a branch of the family established themselves at Berehaven, but were all slain by the Irish septs with the exception of Hugh de Barneville, who thereupon returned to England. In 1215 King John granted him the lands of Drimnagh and Terenure, in the County Dublin, which were held by his descendants until the reign of James I, when they were ceded to Sir Adam Loftus. In 1461 Robert Barnewall was created a baron of Parliament by Edward IV., with the title of Lord Trimblestown, and about the same time his brother, Sir Nicholas Barnewall, was appointed Chief Justice of the Common Pleas in Ireland. In 1563, Sir Christopher Barnewall, who was the popular leader of the Irish Parliament, strongly inveighed against the constitution of the Irish House of Commons, which was largely composed of non-residents and persons elected for non-corporate towns, and, therefore, not entitled to sit in Parliament. In 1575 there died at Turvey, as already stated, this distinguished member of the family, described by Hollinshed as "the lanthorn and light as well of his house as of that part of Ireland where he dwelt; who, being sufficiently furnished as well with the knowledge of the Latin tongue as of the common laws of England, was zealously bent on the reformation of his country." His monument, as also that of his wife, is to be seen in the church of Lusk. In 1597 the son of Lord Trimblestown was appointed to command a contingent of Anglo-Irish assembled at Mullingar for service against Hugh O'Neill, Earl of Tyrone. Richard Tyrrell, a gentleman of English descent, was selected by O'Neill to take the field against this contingent. The result was the battle of Tyrrell's Pass, where by a feint retreat, Tyrrell lured the Anglo-Irish into a narrow pass through a bog, and then fell upon them front and rear. An utter rout followed, the Anglo-Irish force was all but annihilated, and their commander, young Barnewall, was taken prisoner and sent in custody to the Earl of Tyrone. During the troubles of 1641, Patrick Barnewall, of Kilbrew, one of the most influential and respected gentlemen of the Pale, surrendered himself to the Earl of Ormonde and received a safe conduct to Dublin, but nevertheless, on his arrival at the Castle, he was imprisoned and put on the rack, which torture he endured, according to Leland the historian, with so steady an avowal of his innocence, supported by abundant evidence, that the Lords Justices became ashamed of their cruelty, and to make amends to this unfortunate gentleman, permitted him to reside in Dublin, and took steps to protect his estate from spoliation by the soldiery. In the same year the Barnewalls took an important part in the muster on the hill of Tara, of the Catholic gentry of the Pale, to protest against the intolerant government of Lords Justices Parsons and Borlase at Dublin Castle. Nicholas Barnewall, of Turvey, having fled, during this period of trouble, with his family to Wales, returned in a couple of years, whereupon the King, convinced of his loyalty, as attested by many services, created him, in 1645, Baron Turvey and Viscount Barnewall of Kingsland. In 1650, Mathias, 8th Baron Trimblestown, having been excluded from the Act of Grace and Pardon, was outlawed and attainted by Cromwell and transplanted into Connaught, although he had taken no part in the civil wars; and in 1689 King James II. ordered the issue of a warrant annulling the outlawry affecting the title, but the process was interrupted by the Revolution. In 1691, Mathias, 10th Baron, was one of the hostages from the Irish Army pending the Treaty of Limerick, and after the violation of the Treaty, he and his brother entered the service of France as officers in the Irish Brigade. Lord Trimblestown fell in action in 1692, whereupon his brother returned to his native land and recovered the family estates. Other members of the family distinguished themselves in the French and Spanish services, and rose to positions of distinction. In 1795 Thomas, 13th Baron, who had conformed to the Established Church, sought and obtained an annulment of the sentence of outlawry promulgated by Cromwell against his ancestor, and judgment of the reversal was duly entered in the records of the Court of King's Bench, as if issued in 1689, it having been established to the satisfaction of the Court that the King had intended to grant it in that year. Distances in miles from G.P.O. - Swords, 9; Donabate village, 12½; Coastguard Station, 15, and back to G.P.O. by same route, 30 miles. A glance at the map will suggest other routes for the return journey, any of which will, however, add to the distance.